Democracy Index 2017 provides a snapshot of the current state of democracy worldwide for 165 countries and two territories. This year’s report records a significant decline in global democracy, with 89 countries experiencing falling scores, almost three times as many that saw improvements. The Economist Intelligence Unit’s Democracy Index provides a snapshot of the state of democracy worldwide for 165 independent states and two territories. This covers almost the entire population of the world and the vast majority of the world’s states (microstates are excluded). The Democracy Index is based on five categories: electoral process and pluralism; civil liberties; the functioning of government; political participation; and political culture. Based on its scores on a range of indicators within these categories, each country is then itself classified as one of four types of regime: “full democracy”; “flawed democracy”; “hybrid regime”; and “authoritarian regime”. A full methodology and explanations can be found in the Appendix. This is the tenth edition of the Democracy Index, which began in 2006. It records how global democracy fared in 2017. The results are discussed in this introduction and in greater detail in the review of the regions that follows. A special focus of this year’s report is the state of media freedom around the world and the challenges facing freedom of speech. In this part of the report, we present our Media Freedom Index and global ranking. 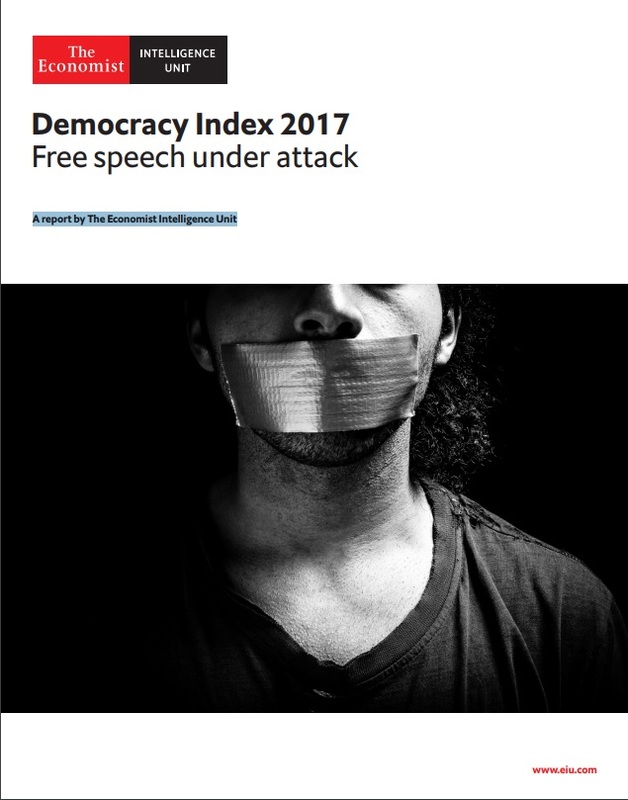 The report discusses the importance of free speech for advancing and strengthening democracy and examines the constraints on exercising freedom of expression around the world. We look at how media freedom and freedom of expression are faring in every region.